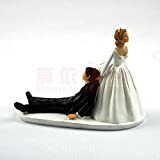 This personalized cake topper is unique desig for you, it is a best gift for wedding or anniversary party, the decoration on your special cake. Note:THIS IS A RUSTIC CUT DESIGN. The edges will not be perfectly smooth but instead will have a bit of a rigid hand sawn look to keep with the rustic theme.